The Accidental Mother is the fourth book I have read by Rowan Coleman and they have all been equally good. 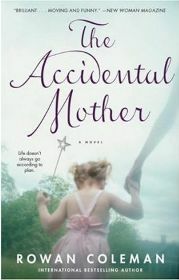 In this book the ‘accidental mother’ is Sophie, the heroine of the story! When we first meet her she is a single minded career girl intent on gaining promotion and only caring about material things such as her Manolo Blahnik shoes! The title of the book might imply that through her own carelessness or perhaps a one night stand Sophie accidentally becomes pregnant and has to change her life accordingly. This, in fact, is not the case at all. Sophie becomes mother to her best friend’s children, after the friend is tragically killed in a car accident. This is all due to a drunken promise made a few years before and we discover that Sophie is certainly a girl who keeps her word. The book is really about Sophie’s emotional journey as she struggles to come to terms with instant motherhood and the loss of her freedom. Also, mixed up in all this, are her troubled feelings about her old friend. This is particularly so after she discovers that the happy ever after she had imagined for her friend is far from the truth seeing as she had been left by her husband when she was expecting her second child. Sophie deals with her new found predicament by believing that it is only temporary and sets off on a mission to find the girls’ father and to reunite them. Although she succeeds, she also finds out that nothing is plain sailing and she still has a strong role to play in all their lives. I don’t want to say too much in case of ruining what is a really good read but there are certainly a few twists and traumatic events as the book heads towards an emotional climax. The girls are lovely and anyone who has young children will at least partly recognise elements of their own! The characterisation in this book is excellent. At the beginning, I didn’t think I was going to like Sophie as she seems the typical material career girl. However, as the story unfolds, I found myself feeling more sympathetic towards her as Rowan Coleman develops the more loving side of her character well. My feelings towards the girls’ father also changed throughout the book. Expecting him to be the typical villain, it was not long before I started to emphasise with his situation, and of course, realised that there are two sides to every story. The real stars of the story are the two little girls. I feel that Rowan Coleman captures the essence of childhood really well. Fun loving and mischievous one moment, scared, fragile and insecure the next! The girls are lovely and anyone who has young children will at least partly recognise elements of their own! The story is well paced although it did take me a while to get into it. However, towards the end I found I couldn’t put it down and there were pages which actually had me in tears whereas others had me laughing out loud! I really wanted to find out what happened at the end! This is obviously not a book for everyone but if you are into slightly less lightweight chick lit I would really recommend this book. No Comments on "The Accidental Mother"